Dhaka, 6 May, Abnews: Prime Minister Sheikh Hasina on Sunday inaugurated the distribution programme of family silos for 63 upazilas in 19 disaster-prone districts in the country with a view to preserving food grains and seeds during any disaster. She launched the programme by opening the distribution activities of the family silos at three upazilas of Jhalakathi district through a videoconferencing from her official residence Ganabhaban in the city. The Prime Minister also exchanged views with beneficiaries of the family silos in Jhalakathi. The plastic-made family silos have been distributed under ‘Modern Food Storage Facilities Project’ which is being implemented by the Food Ministry with an objective to increase the grain reserve available to households to meet their post-disaster needs and improve the efficiency of grain storage management. The government has taken a programme to distribute some five lakh family silos in 63 upazilas of the disaster-prone 19 districts under the project involving the total cost of US$ 240 million (Tk 2,000 crore approx.). Of the cost, the World Bank finances US$ 210 million. The quality of food grain including paddy and rice, and seeds will remain intact if these are preserved in air-proof silos during any cyclone, tidal surge, flood and draught. Each of the 70-litre capacity family silo can preserve 56 kilogram rice and 40 kilogram paddy. The people can meet their demand of food during any disaster preserving food grains in the silo, which is made of food grade plastic. The weight of each silo is only six kilogram. The project is being implemented in 19 districts- Bagherhat, Khulna, Satkhira, Barishal, Pirojpur, Jhalakathi, Barguna, Patuakhali, Bhola, Sirajganj, Bogura, Gaibandha, Kurigram, Brahmanbaria, Cumilla, Habiganj, Sunamganj, Kishoreganj and Netrakona. Food Minister Md Qamrul Islam also spoke on the occasion, while Principal Secretary of PMO Md Nojibur Rahman conducted the event. Food Secretary (In-charge) Shahabuddin Ahmed made a video presentation over the project. Addressing the function, the Prime Minister said the government is now distributing the family silos in 63 upazilas, but it will distribute those in all upazilas in phases in the future. “We’ve taken step. If it is implemented, I think we will never have food scarcity during any disaster,” she said. Sheikh Hasina suggested that the affluent families can also build the family silos at their own cost. The production cost of each silo is Tk 1,377, but the government is distributing it at token price of Tk 80, she said. Noting that her government constructed some modern large silos in the country, she said the food grains will not decay in the silos for two-three years as there is ceiling system in the godowns. She said the government has earned the capacity of stocking 21 lakh metric tons food. The Prime Minister said father of the nation Bangabandhu Sheikh Mujibur Rahman always used to say that the people of Bangladesh would get food, clothes and improved lifestyle. Building a war-ravaged the country, the Father of the Nation turned a province into a full-fledged country and had plans to fulfill the basic demands of the people, she said. “My father (Bangabandhu) sacrificed his whole life for the people of this country. So, only goal of my life is to fulfill the basic demands of the people,” she added. When Awami League came into power in 1996, the country was in deficit of 40 lakh metric tons of food, but it made Bangladesh a self-reliant country in food, she went on. 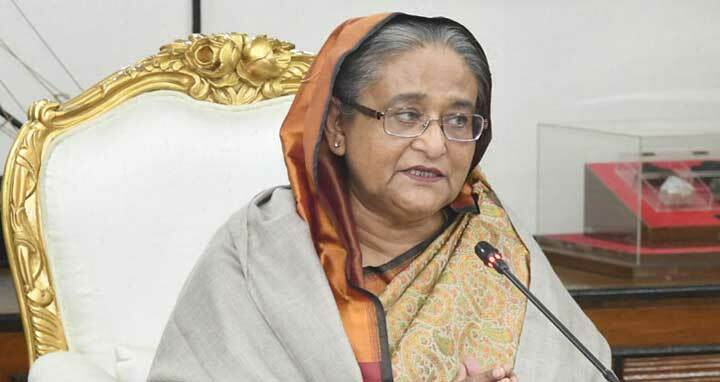 “Their (BNP’s) attitude was to keep Bangladesh a beggar country and nation, as well as to loot money bringing foreign assistance by showing misery of the people,” the Prime Minister said. She said her government was able to make Bangladesh a food-surplus country immediate after a long-lasting and devastating flood in 1998 when 70 percent of the country’s lands went under water for some 70 days. Though the international community had predicted that some two crore people would die in the 1998 flood, her government successfully faced the devastating flood, Hasina said. She said her government increased food production from 1.80 crore metric tons to 2.69 crore metric tons during its 1996-2001 regime. But the BNP-Jamaat government could increase it only to 2.80 crore metric tons. Assuming power in 2009, her government has increased the food production to 3.88 crore metric tons now, she mentioned. The Prime Minister stressed the need for establishment of new modern rice mills in the greater Barishal and Khulna regions as there are no such mills in the regions.